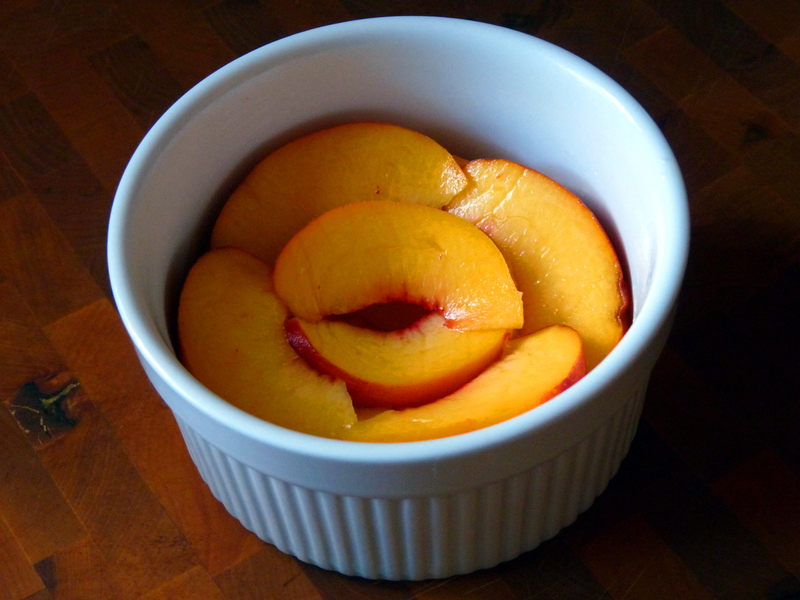 And since peaches are in season, I’ve been canning a bunch. 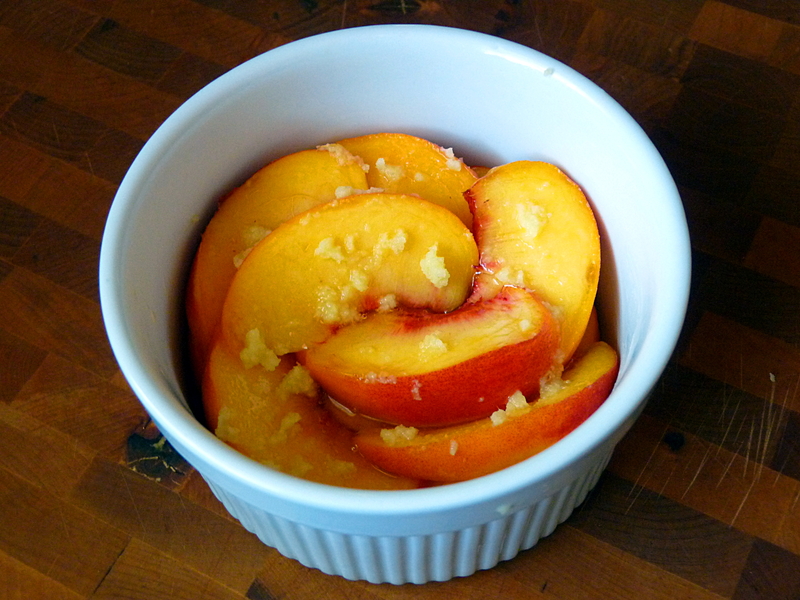 I made an AMAZING peach-rosemary jam and canned some honey spice peaches as well. I bought a 16 lb. box of peaches for doing things with, and after canning several recipes’ worth, I had a few left. I wasn’t up to any more canning, so while I was driving home from Little Man’s doctor’s appointment (double ear infection) I was scheming about what to do with them. Initially, I thought about making a ginger-peach tarte that I’ve made before, but I decided it was too much work and it’s not the easiest thing to keep in the fridge for a few days as my husband and I eat it. I had all the ingredients for the tarte, so I decided to rethink them. And then it came to me. 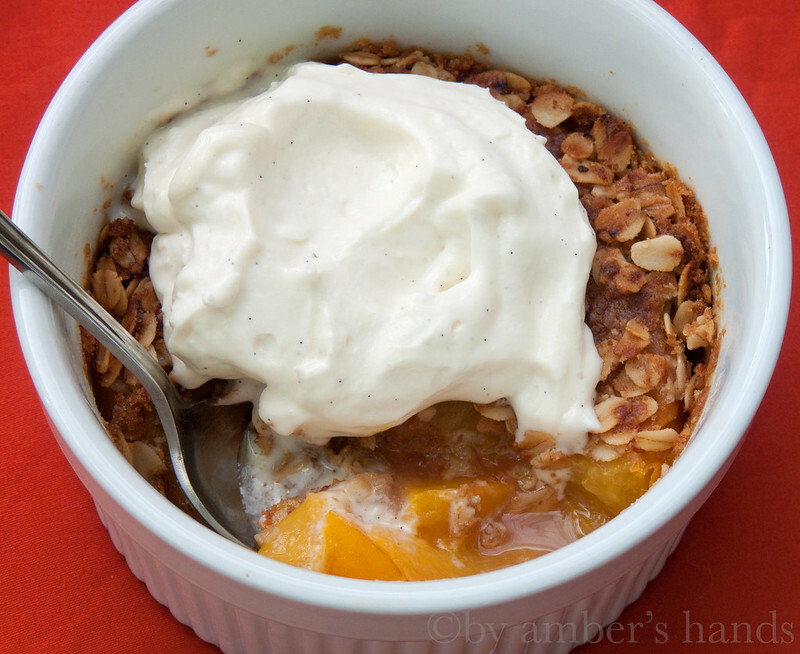 A peach crisp. With honey and ginger and nutmeg. Topped with a whipped cream/cream cheese/vanilla mixture. With a twist. I wanted it to be pretty simple, not fussy, but full of delicious flavor. 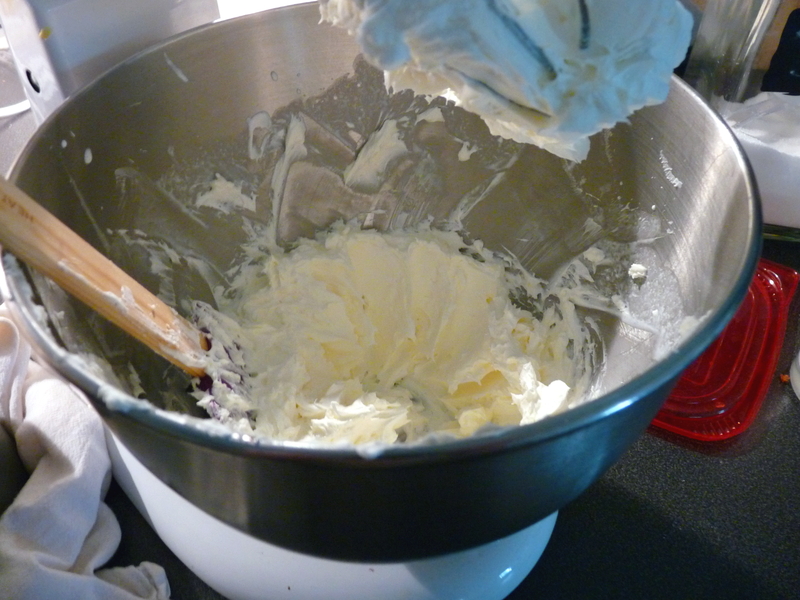 Start off by buttering 4 16-oz ramekins. 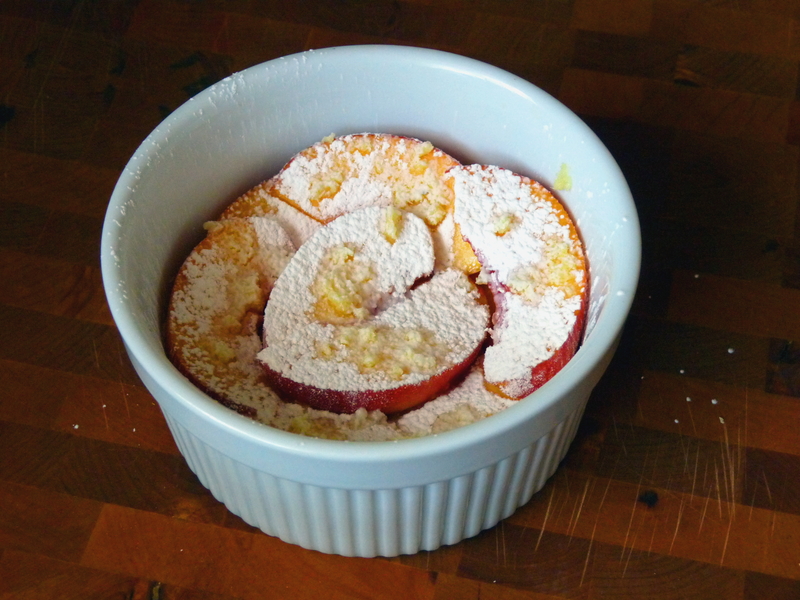 Pit 4 peaches, and slice each into sixteenths. Grate some fresh ginger into each. 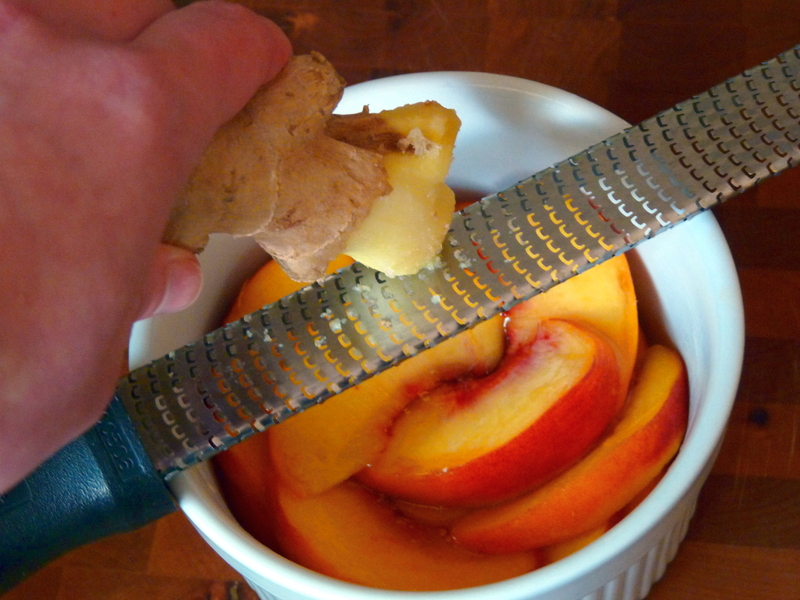 Did you know the best way to peel ginger is with a spoon? Just scrape the ginger with the edge of the spoon. This will take off the skin without losing any of the flesh. Grating the ginger over the peaches didn’t really distribute it. It mostly stuck to the other side of the microplane. So I just dotted it over the peaches with my finger. 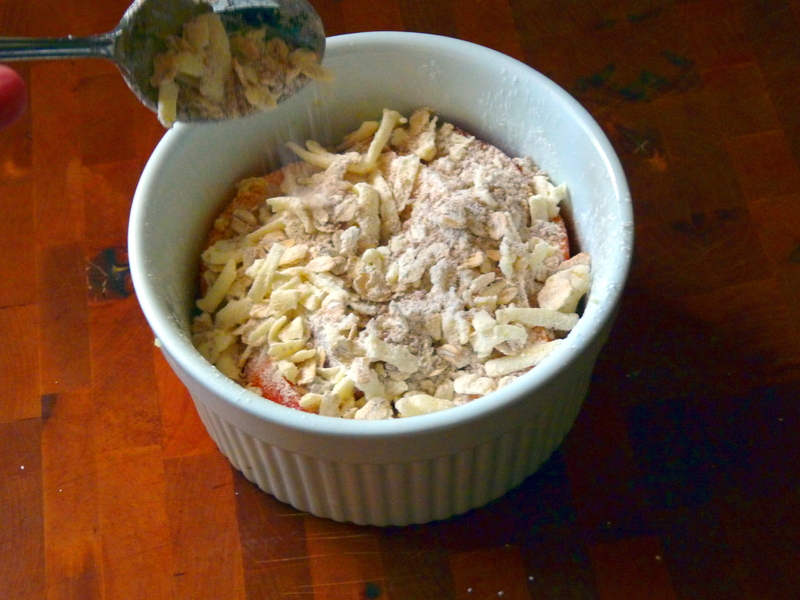 Now, turn your attention to the streusel. Huh? Oh, sorry. Right. 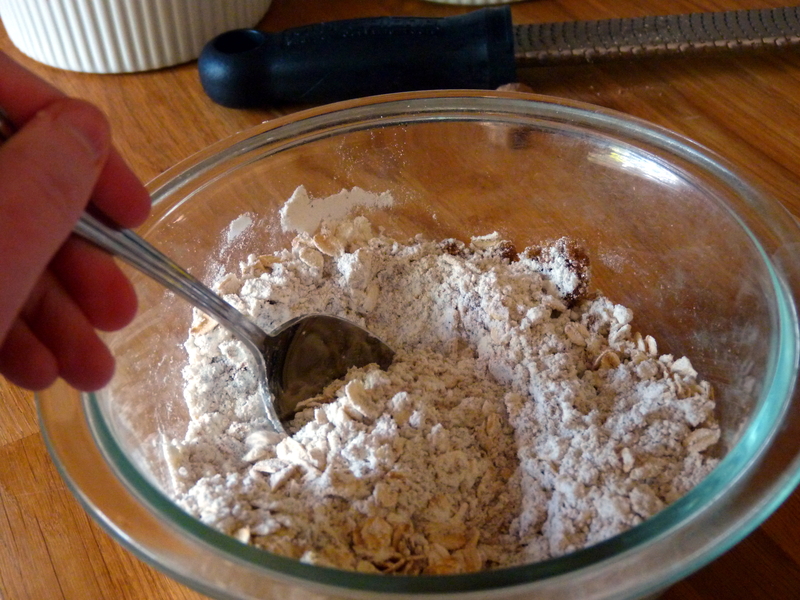 How to make the streusel. 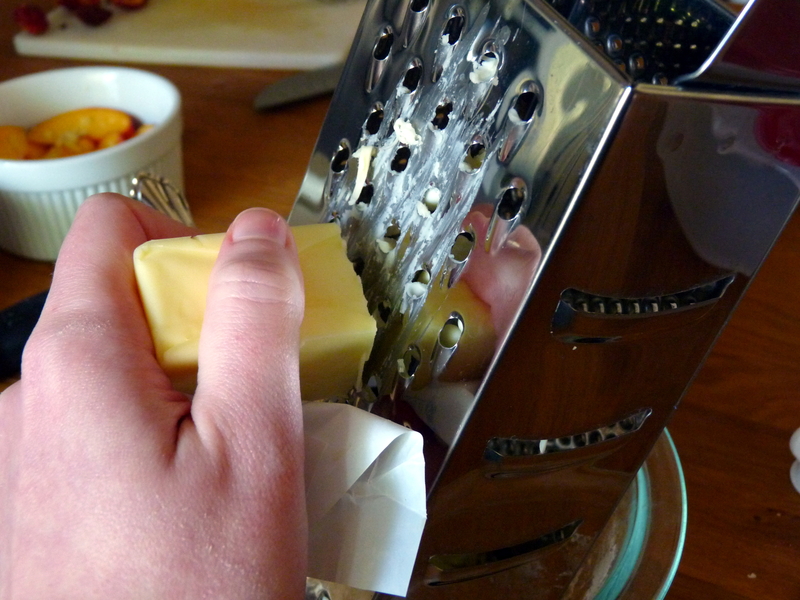 Throw half a stick of butter in the freezer for about 10 minutes. 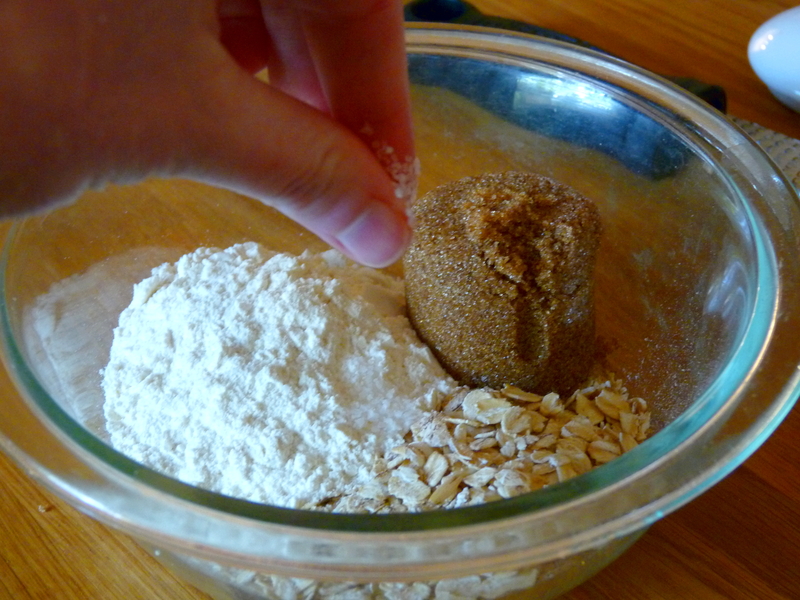 Put 1/2 cup old-fashioned oats, 1/2 cup flour, and 1/4 cup brown sugar in a bowl. 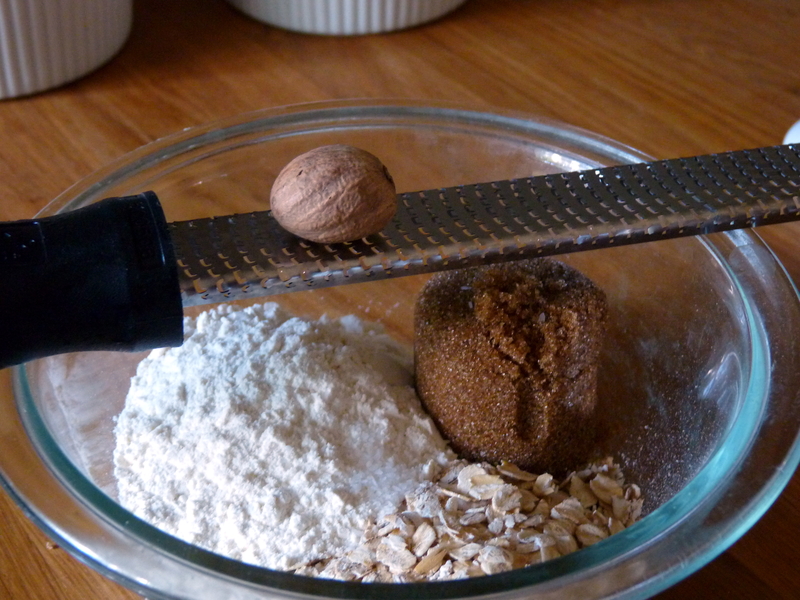 This was the first time I’d ever used fresh nutmeg. It was softer than I expected. And I was kind of surprised at the difference in flavor. It’s somehow mellower and stronger at the same time. 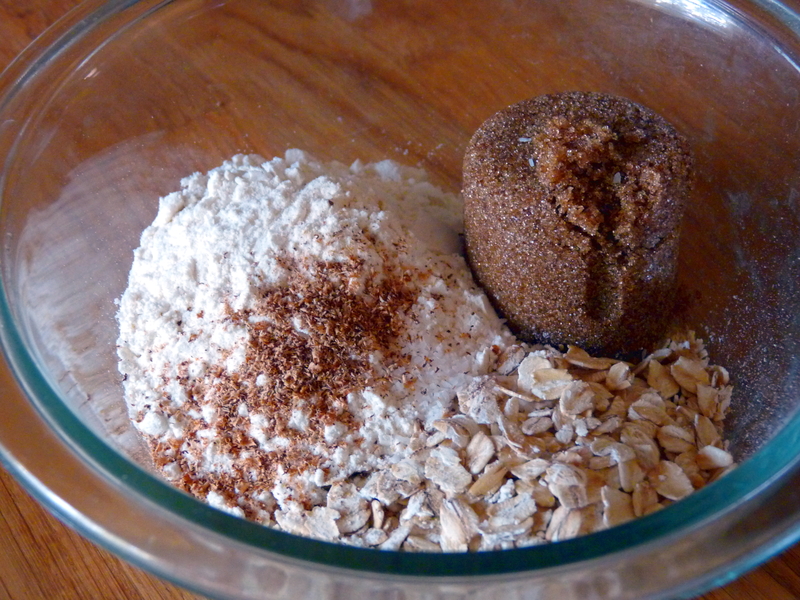 It’s everything I like about nutmeg without the stuff I don’t. That was a coherent thought. Now take that butter out of the freezer. Grate it on the large grate side of a box grater. Or whatever kind of grater you have. If you’d prefer, you can also just use cold butter out of the fridge and a pastry cutter, but I like this way a lot better. That’s just me. 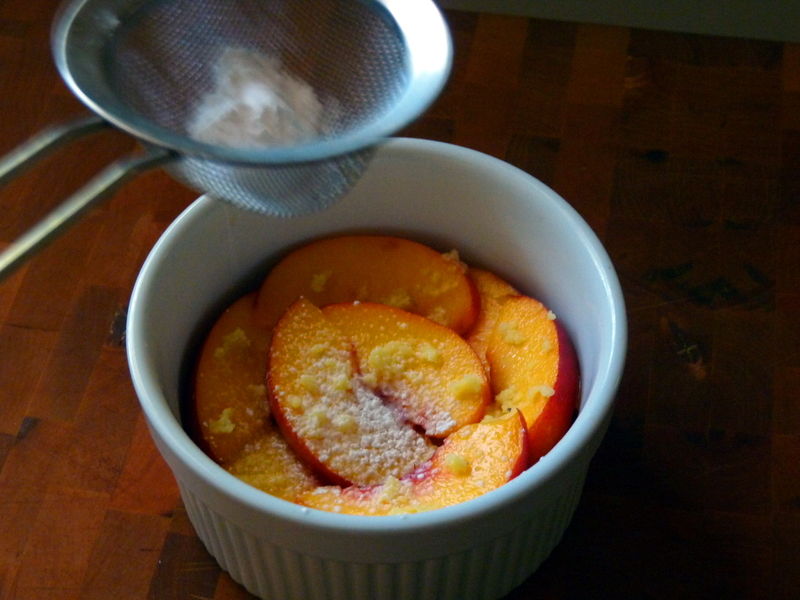 Sift about a teaspoon of corn starch over the peaches in each ramekin. 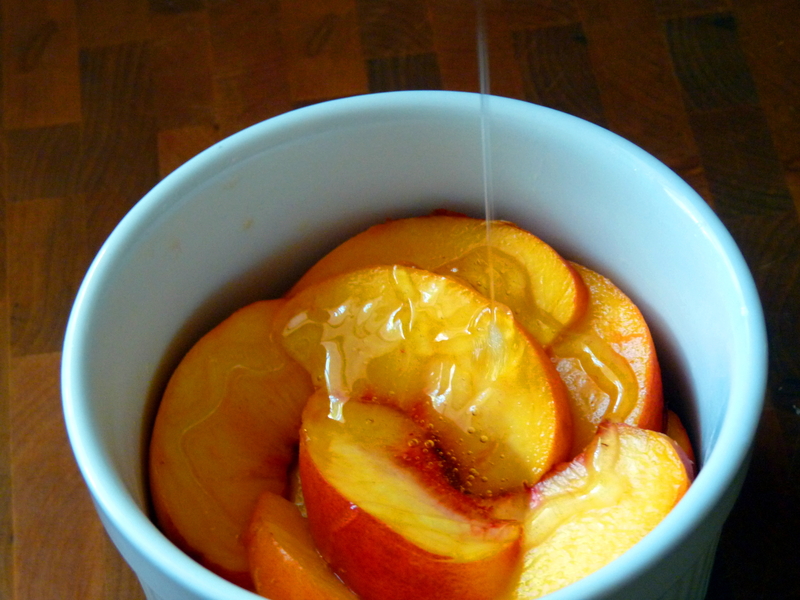 This will mix with the juices that come out of the peaches as they cook, and make it a bit saucy. And as you know, I’m all about the sauciness. Spoon the stroooosel over the top, distributing it evenly between the 4 ramekins. Bake in a 350〫oven for about 30 minutes, or until golden and crisp. That’s why they call it a “Crisp,” friends. While it’s baking, you can turn your attention to the deliciousness that will later adorn the top of said crisps. Oh goodness. I can’t even tell you how good this is. I really shouldn’t even show it to you. Maybe you’re on a diet. Maybe one day you’ll be on a diet. This will ruin your current diet and any diet you’ll ever be on ever if you try it. Don’t say I didn’t warn you. You’ll need 4 oz. of softened cream cheese. If I were a good person I would have told you to take it out of the fridge before you started anything else. But I didn’t tell you then. But I’m telling you now. Do it before you did any of the rest of the stuff. Retroactively. 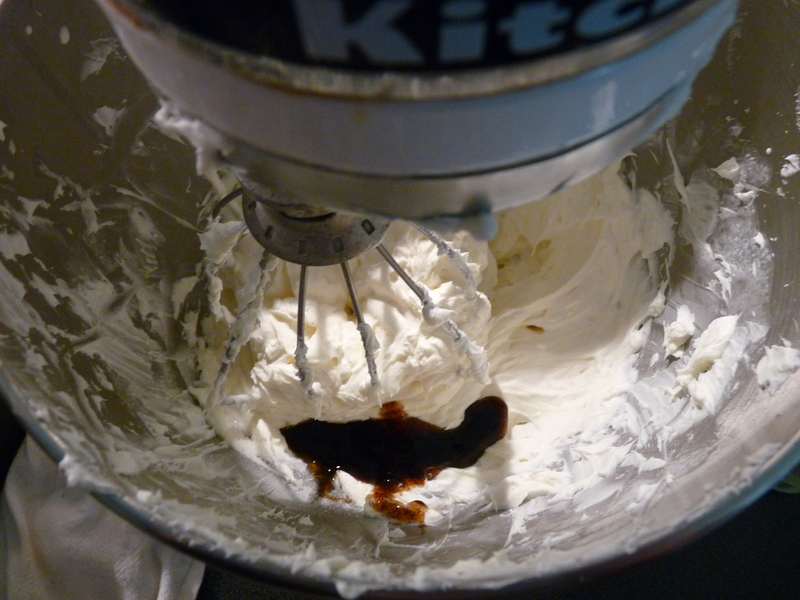 Beat the cream cheese and 1/4 cup sugar in the bowl of an electric mixer. Add 1 cup of heavy cream. Beat this, scraping down the sides of the bowl as needed, until stiff. Now is where it starts to get crazy. If you’re feeling a bit naughty–and I always am— you can add a little bit of something awesome. If you’re sensitive to all things alcohol based, you should avert your eyes at this point. 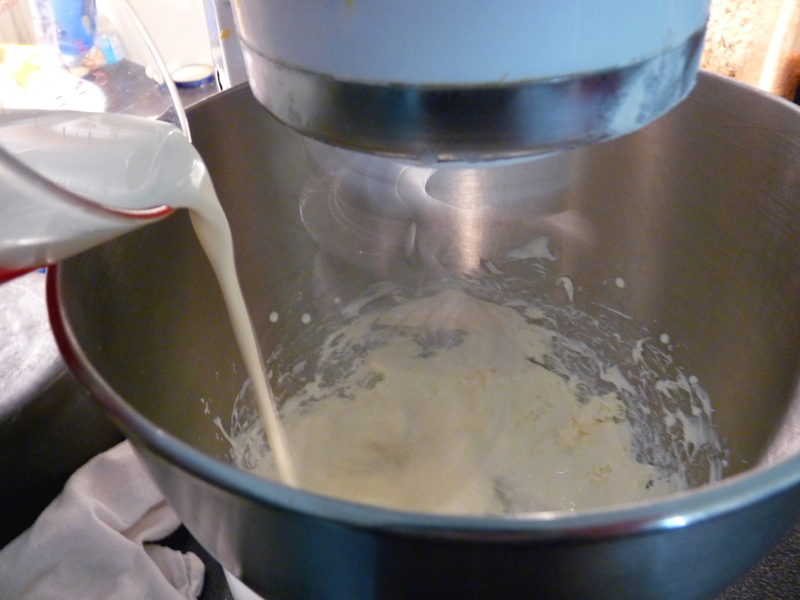 Beat about 1 Tbsp of brandy into the cream cheese/heavy cream mixture. 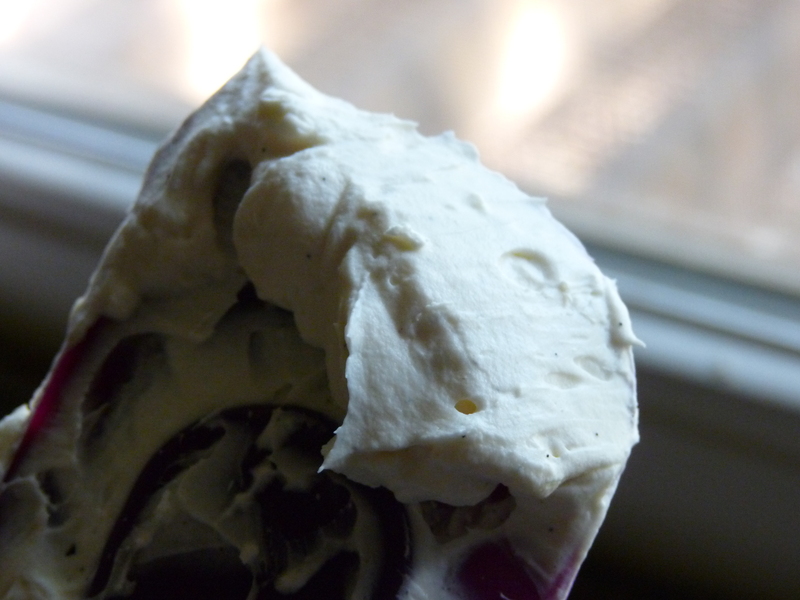 cream cheese + heavy cream + brandy = oh my stars delicious. You can add a little more if you like things extra boozy. Sidenote: taking a picture while pouring brandy makes for a little boozier than I was going for. But once it was on top of the crisp the flavors melded really well and it wasn’t overpowering. Add 2 teaspoons of vanilla bean paste. 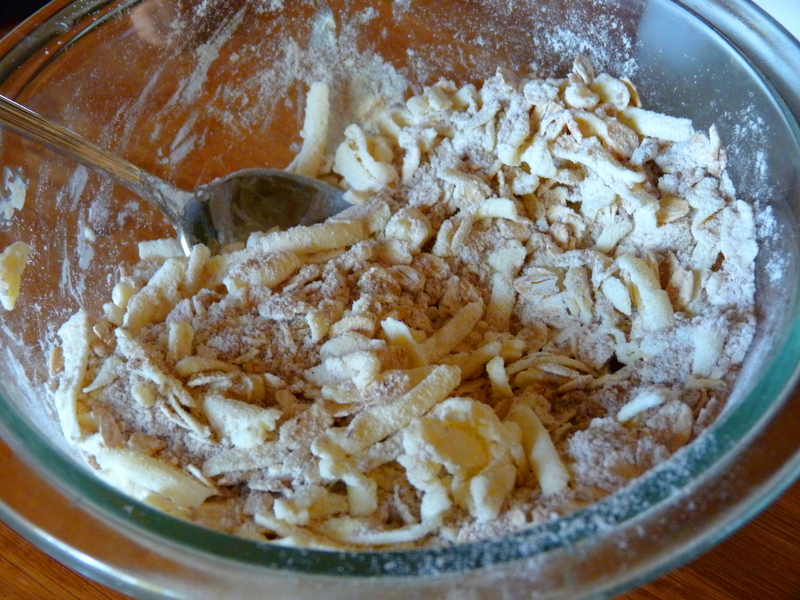 Or, if you don’t have any, 2 teaspoons vanilla extract or scrape 1 vanilla bean into it. Will you just look at that? It’s so pretty with all the flecks of vanilla. 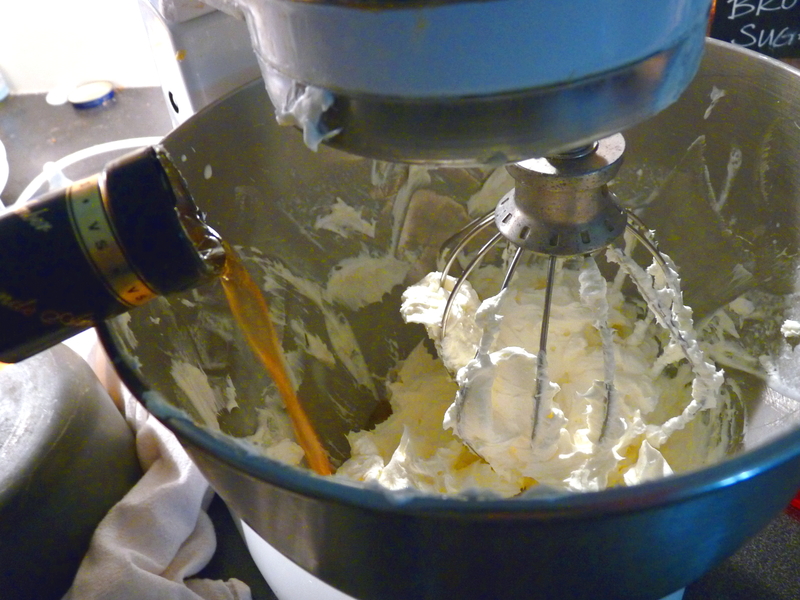 cream cheese + heavy cream + brandy + vanilla = what heaven tastes like. At least it was the last time I took a nibble of heaven. Uh, ok. Let’s move on. Once this is all combined, and your crisps have come out of the oven, put a healthy (ha!) 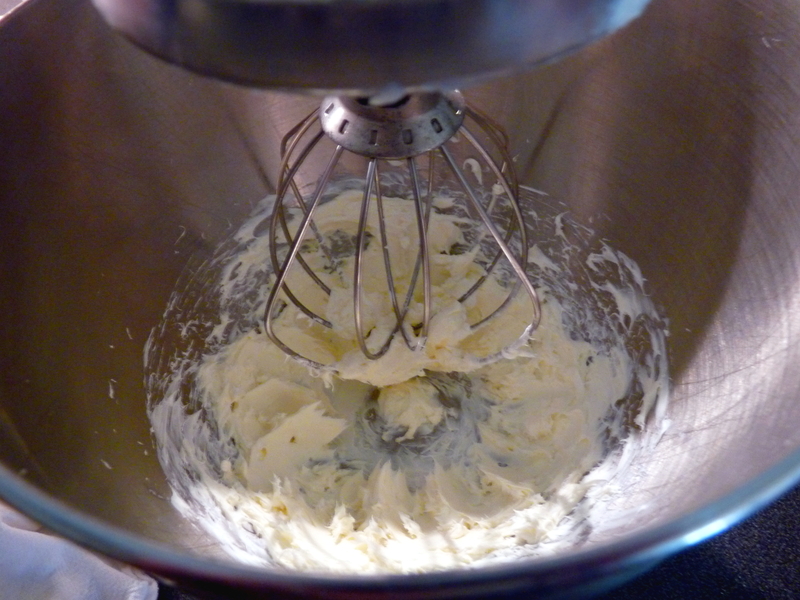 dollop of the cream mixture on top of the crisp. Now taste, and melt into the diet-ruining, swoon-inducing perfect mixture of flavors. Then you’d see me on one of those TV shows where someone can’t understand how they got to weighing 800 lbs. 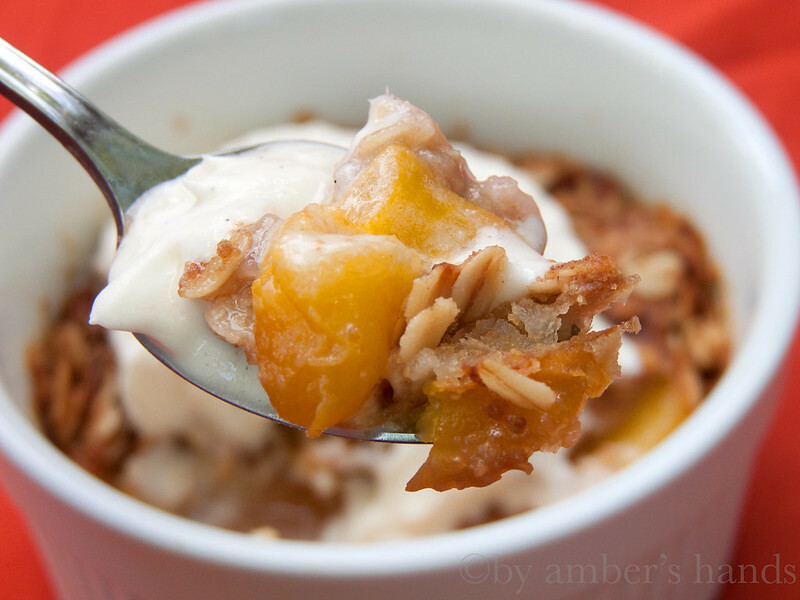 So you should make this while peaches are still in season. And then maybe wait to make it again until next year. If you possibly can. Get the printable from Tasty Kitchen!